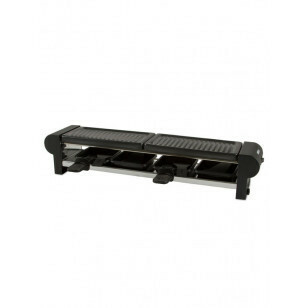 The Raclette Maxi from the Pro Collection (220 volt) is one of the showcase pieces of the Boska Collections. The Raclette Maxi comes with a set of 4 porcelain pans, 4 spatulas and detachable grill plates. The name 'Raclette' derives from the French word racler, which means ' scrape '. The cheese is heated on one side, and when melted is scraped off and typically served with potatoes, pickles and onions. The set is dishwasher resistant.